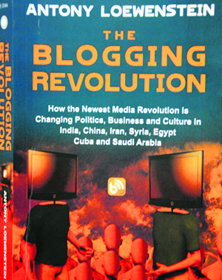 The Blogging Revolution by Australian freelance journalist Antony Loewenstein is a striking account of the writer's investigation of the web's role in repressive regimes which brought him face-to-face with bloggers risking torture, imprisonment and even death. Antony's travels to Iran, Egypt, Saudi Arabia, Syria, Cuba and China get him talking to a vibrant universe of bloggers struggling to be heard under difficult conditions. For them, everyday is a struggle, pitted as they are against the random tide of authoritarian regimes, in stark contrast to the scenario elsewhere on the global map where freedom is taken for granted as an everyday commodity. The work gets the reader to experience what citizens themselves feel about their situation. This is in contrast to journalistic accounts where quoting official sources or being close to power is a priority. To put things in perspective, he gets talking about Arab Spring: "Revolutions thundered across the Muslim world in 2011. Regimes fell and leaders fled into exile. 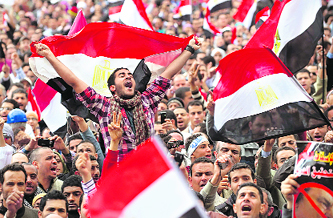 Millions of citizens rose up to oust and challenge largely western-backed dictators." And about Tunisia, the spark: "Frustrated street vendor Mohamed Bouazizi set himself alight in the city of Sidi Bouzid on 17 December 2010 after constant harassment by local authorities... on Facebook... soon viewed across the Arab world by millions. Protesters took to the streets.... With roughly a third of the Tunisian population having access to the internet, Facebook became an essential tool in spreading the word... despite authorities shutting down power supplies... within weeks the president and his family fled the country." The phenomenon runs wide. The author cites a Twitter enthusiast saying: "Saudis cannot go out to demonstrate, so they retweet!" Shortly before the disputed 2009 elections that brought Ahmadinejad back to power in Iran, one woman, Neda Agha Soltan, shot by a sniper's bullet in Tehran, became a symbol of resistance, the video of her death being watched by millions on YouTube. Internet censorship is the state's weapon: "Russia, China and Iran, far more seriously monitor and infiltrate online spaces to root out any possible dissent." Even then, as an Iranian blogger told Antony: "They block and we evade the blocks. It goes on everyday. They code, we decode." The overthrow of Iran's democracy by the West in 1953 is conveniently overlooked in the proselytising today about bringing freedom to the Middle East. A blogger and journalist was detained in Iran in late 2007 for daring to reveal that Ahmadinejad's security staff had bought dogs from Germany for roughly $1,50,000 each. Iran's burgeoning online community has fundamentally changed the national conversation and forced the ruling mullahs to at least recognise the necessity of reaching the massive youth population. This in a country where in some remote towns, stoning of allegedly adulterous women still takes place. The complicity of Western technology and security firms with autocratic states has only worsened of late. Chinese dissidents pursued legal action in the US in June 2011 against Cisco Systems for knowingly assisting Beijing in its Golden Shield. Google, McAfee, Yahoo, Microsoft... the list goes on, up to a point where human rights take a backseat to profit-making. And a reminder: "Google is a commercial organisation, that has offices in India and advertising space to sell. Monitoring censorship and privacy issues are not just concerns in repressive states." Antony met an Egyptian woman blogger who started blogging to promote human rights and to campaign against 'female circumcision' (female genital mutilation). Her blog has made her distinctly unpopular with large segments of the Islamist population. China's state news service Xinhua claims there are more than 3 lakh government employees who spend their days monitoring the web for dissent and removing suspect comments. Even mild criticism of the regime has led to arrest, physical abuse and imprisonment. Alternative media and the blogosphere are providing an outlet to hear the hopes and fears of a generation that wants to be heard. The candour and courage of these bloggers, which, one of them tells Antony, is simply a necessity shine through in plain language. The reader gets an understanding of lives and dilemma of citizens in repressive regimes, and rather than eulogising the merits of online activism, it is a telling account of the challenges bloggers are up against.